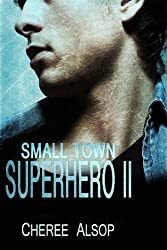 Small Town Superhero 2 follows along with Kelson and Magnum now that the Bullets have stopped trying to make Sparrow a drop point for drugs. Having a sidekick isn’t as easy as Kelson thought, especially not one like Magnum. But the leader of the Bullets has a much kinder heart than he lets on, and his support may be all that gets Kelson through the Black Rider’s next few challenges. With the gangs trying to take revenge and thievery happening in the gas stations, Kelson needs backup. But then the unexpected happens, leaving Maddy in desperate straights. Kelson’s been there, and he wants to help. But there’s only so much of a broken heart that he can fix. Now Kelson has to be the hero, not for himself or even the town in general. Now he has to be the hero for Magnum, and for Maddy. In book two, Kelson really grows into himself as a man. But he’s reckless and his heart hasn’t completely healed. While risking his life for the town sounds noble, its tragic for those that love him both as the Black Rider and as Kelson, two sides of the same coin.